My family are big readers like me. I remember petty squabbles ensuing among adults because one cousin/sibling failed to return a borrowed tome. Or how one person would refuse to lend out any more of his/her books because the borrowers turned into takers or his/her precious book got damaged (I'm guilty of the latter). The elders' love for reading thankfully got transferred to the children and while I was busy with Francine Pascal's Sweet Valley books, my dorkier cousin was into CHOOSE YOUR OWN ADVENTURES. Choose Your Own Adventure (Bantam Books) is a series of children's gamebooks where each story is written from a second-person point of view, with the reader assuming the role of the protagonist and making choices that determine the main character's actions and the plot's outcome. Each gamebook was about 100-150 pages or so but don't be fooled by it's "shortness". It's easy to spend hours reading the same story 100 different ways without getting the exact story you want to. The books doesn't read like a normal forward moving novel. At the end of each chapter, you're given choices and depending on what you choose, you either go back or skip ahead. It's this flash-forward motion that makes reading these books fun and engrossing. I remember spending a week with Journey Under The Sea and recall "dying" so many times, I gave up trying to solve it! So I read it like a traditional novel out of sheer frustration. It didn't make sense of course, but in my head that was my revenge for not letting me win just one frickin' time! But of course, I wasn't aware of these back then. All I wanted was to read, have an adventure, and win. I wasn't aware that the books were a great exercise in honing decision making skills, I wish I spent more time with it because I could've used the training. Ha! Anyway, I'm not sure if they're still reprinting CHOOSE YOUR OWN ADVENTURE books. If you happen to find one, I suggest you grab one and play it with your kids, sibling, nephew/neice, etc. Hopefully they'll enjoy it enough that it'll get them off their phones or tablets and/or get them into the habit of reading. oh yes, I totally remember reading Choose Your Own Adventure in the fifth and sixth grade. These books were so cool. I wonder why no one has modernized this concept. They were so fun. Good news, I've seen two blog posts featuring authors that are doing a version of this! Aww, this is so sweet of you, Braine! Personally I don't know anything about these books (one of the "perks" of living abroad), but I'd sure love for my son to read one :) Enjoy your weekend! Is that right? I'd think this was everywhere, I grew up in the Philippines and we had it. Maybe your used bookstores have a few volumes? I was more into the Sweet Valley books as well and I didn't read the Choose Your Own Adventure. Well, I tried but I never liked them. But still, I love the creativity and how they are great for some readers. Yeah, from an author's standpoint, it's a great way to play with your story. You can add almost every idea you have for a single plot. It must've been a challenge to write as well. I've never tried these books before. I think my son would probably enjoy these! He might, most of the books are of the action-fantasy kind so he just might enjoy it. I think it is so if you have some laying around, hold on to them. They might be worth a lot someday. And thank you, it's a work in progress. I have to take a break though because formatting a blog is no easy task for an ignorant like me. Those were great. I remember getting just as frustrated with a Mayan adventure. It's so hard (for me at least) to win in these darn books! 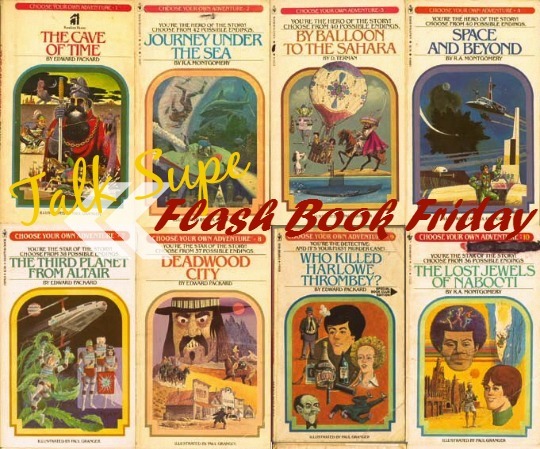 I've never come across the Choose Your Own Adventure books, but I LOVED these type of books as a kid. I had a couple of goosebumps books that were choose-your-own-adventure based but with a scary theme, of course. I was a big reader as a kid as well. This was something my mom instilled in me as a kid when she would read to us at night. I'm the only one she based the love onto, but my grandma, mom and I are always trading books back and forth. I'm very picky and have to read my copies first because I don't like it when other people bend the spine before I get a chance to read it (if I buy it new) heh. I read a few Goosebumps but didn't know they had editions like this. You just gave me a research assignment! I get to play a dragon? Do I get to choose what I look like? I always thought that these were so cool. I am surprised that the idea didn't really take off. It would actually be cool to see them written as older YA and adult. I considered trying to get the originals in the past, but they can be crazy expensive for something that is really no more than a whim to me, but they are cool. I loved these as a kid! WE have Journey Under the Sea, got it at a bookstore a few years ago, so it might still be in print, not sure. I think it was re- released maybe with some changes? Love this post, those were a lot of fun. I used to love these- I thought they were the greatest thing EVER, lol. And I was OBSESSED with Sweet Valley; as fast as those books got churned out, I would devour them. That's so fun!! I totally missed out on those as a kid. I think I saw something a few months ago about an author writing a romance series that way where you could pick and choose different paths to get to a couple different outcomes. Very different.